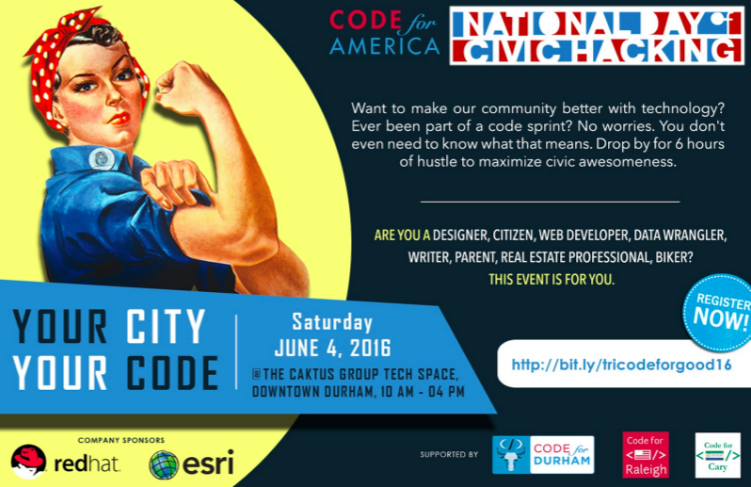 Code for Durham recently participated in Code for America’s National Day of Civic Hacking. 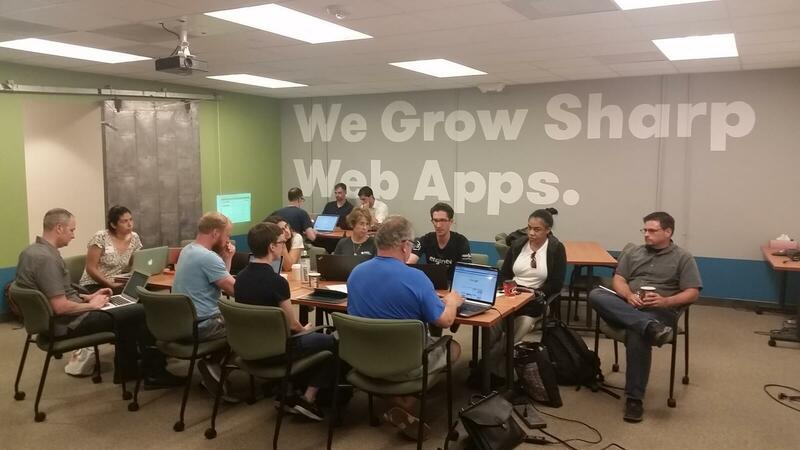 Hosted in the Caktus Group Tech Space, the event was attended by more than 50 local participants. Community manager of opensource.com, Jason Hibbetts acted as emcee for the day. He introduced the two planned projects from Code for Durham and fielded project pitches from other attendees. During the day, participants broke into teams to work on a total of five projects. These included Code for Durham’s School Navigator—a platform for geolocating nearby publicly-funded schools and accessing information on those schools—and CityGram—a notifications platform for local issues like crime data reporting or building permit changes. Caktus’ Chief Business Development Officer Alex Lemann helped coordinate the team working on Durham’s School Navigator. The group consisted of thirteen developers, two UX designers, and Councilman Steve Schewel, who came to learn about the project. Code for Durham members were able to onboard all of the day’s participants to the project, add them as collaborators to the GitHub repo, and introduce them to the project’s backlog. Team members then selected their own tasks from the backlog to tackle. A number of updates were made to the school navigator, including changes to frontend code, revisions to school policy information, deployments to help keep the site running smoothly, and an entire redesign of the school profile pages from a UX perspective. Alex was especially excited by his contribution to the day’s work. Noticing that GitHub only measures collaboration on a project in terms of committed code, Alex created a way of honoring alternative contributions. To accomplish this, he developed contributors.py, which uses the GitHub API to look up every comment added to a particular project. This data is then compiled into a contributors list, making recognition of contributions to a project more transparent and inclusive. 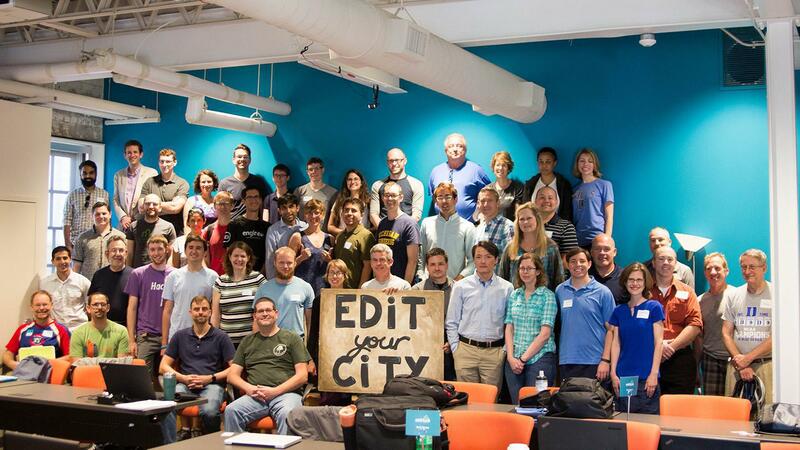 Though the National Day of Civic Hacking is over, work on these projects is ongoing. To get involved, check Code for Durham’s list of upcoming events and be sure to attend one of their civic hack nights. Not local? According to U.S. Chief Technology Officer Megan Smith, more than 100 civic hacking events were held nationwide. To learn how to get involved in your area, visit codeforamerica.org.